I’ve been doing some research on Heijunka and found the article below that I felt was very informative and insightful. The article below was written by Daniel T. Jones and was originally published in Manufacturing Engineering, August 2006, Volume 137, Issue 2, Page 29. It’s clear why Heijunka is the foundation of the Toyota House. This article explains the details of it. If it weren’t, then there would be huge variation across the supply chain, leading to the bullwhip effect. Heijunka is one of those highly useful Japanese words — like mura and muri (see below)-that have had a hard time finding their way into common English usage. (By contrast muda, kaizen, and kanban seem to have made themselves quite at home.) Yet heijunka — which means leveling — is truly critical to creating a lean production system, because it’s the key to achieving stability. Perhaps part of the problem is that when Toyota uses the term heijunka it means two different, but related, things. One is the leveling of production by volume. The other is leveling production by product type or mix. Let’s take them in turn. Suppose that a producer has a highly variable level of orders for a family of products flowing through the same production process. 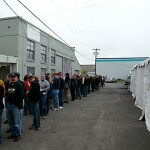 Some weeks customers request 600, some weeks they request 400, and-within the week — demand also varies from day to day. One way to run production — which sounds attractive given today’s widespread notion that producers should be totally and instantly responsive to customers — is to continuously vary output. If the customer wants 600 during a week, produce 600. If the customer requests 120 during a day, produce 120. Correct? Years ago, Toyota reached the counterintuitive conclusion that this is a bad idea. Its reasoning was that no production system can be continuously responsive to gyrating orders without suffering from mura (unevenness in productivity and quality), and muri (overburden of machines, managers, and production associates). And mura and muri together create muda (waste). Toyota managers concluded that it was much better to calculate long-term demand for the product in question, and to run the production process very smoothly at the level of long-term demand. Thus if demand averages 500 per week and 100 per day, run the process at the leveled rate of 500 per week and 100 per day. To do this while never disappointing the customer-whose demand is variable around the average-Toyota calculates a standard inventory of finished goods at the end of the production process for make-to-stock items. (For make-to-order items, it establishes a standard inventory of parts just before the point of customization.) The size of this inventory is proportional to the degree of variability (the amplitude) of customer demand, the stability of the production process, and the frequency of shipments. Suppose that demand varies between 400 and 600 units per week, for example, while averaging 500 over the long term. Suppose also that the production process is completely stable (highly unlikely, but convenient for purposes of this example! ), and that goods are shipped once per week. The minimum standard inventory needed would be 100 units at the start of the week and 600 at the end of the week at the point of shipment. It would then revert to 100 units at the beginning of the next week. And so on. Obviously, if the variability in demand is such that several weeks of 600-unit demand can occur in a row, the producer would need to decide just how much larger standard inventory should be so that customer demand could always be met, yet production levels would not need to vary. Some sort of statistical analysis of standard deviations would be required. At some point-for example if there is significant seasonality in demand-it might be better to adjust production than to carry larger standard inventories, but Toyota tries very hard to avoid frequent changes in output. Toyota years ago came to a very different conclusion. The firm focused on reducing the time and cost of changeovers so that much smaller batches-ideally lots of one-could be produced without a severe cost penalty, either due to lost production time or significant quality problems. Doing this meant that demand for parts upstream could also be leveled, with the benefit of reducing throughput/lead time and total inventories along the entire value stream. The two approaches are contrasted in the illustration: Heijunka by Product Type. 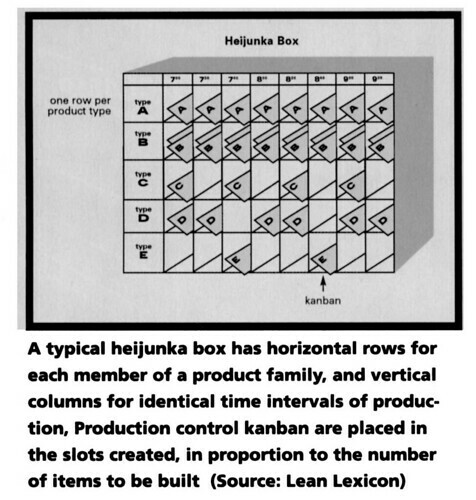 A typical heijunka box (see the illustration) has horizontal rows for each member of a product family, in this case five. It has vertical columns for identical time intervals of production, in this case twenty minutes. Production control kanban are placed in the slots created, in proportion to the number of items to be built of a given product type during a time interval. In this example, the shift starts at 7 am and kanban are withdrawn bv a material handler everv twentv minutes for distribution to the pacemaker point along the value stream. (In a lean production system of this type, there is only one pacemaker point along the value stream where production instructions are introduced. From that point back up the stream, parts are replenished at each break in continuous flow by means of simple pull loops from upstream parts supermarkets.) In the first twenty minutes, the value stream will produce one kanban of Type A, two kanban of Type B, one kanban of Type C, and one kanban of type D.
In the case of Product A, the pitch is 20 min and there is one kanban in the slot for each time interval. However, the pitch for Product B is 10 min, so there are two kanban in each slot. Product C has a pitch of 40 min, so there are kanban in every other slot. Products D and E share a production process with a pitch of 20 min and a ratio of demand for Product D versus Product E of 2:1. Therefore, there is a kanban for Product D in the first two intervals of the shift, and a kanban for Product E in the third interval, and so on in the same sequence. Used as illustrated, the heijunka box consistently levels demand by short time increments, twenty minutes in this case. This is in contrast to the mass production practice of releasing a shift, or a day’s, or a week’s worth of work to the production floor. Similarly, the heijunka box consistently levels demand by mix. For example, it ensures that Product D and Product E are produced in a steady ratio in small batch sizes. Production process stability introduced by leveling makes it vastly easier to introduce lean techniques ranging from standard work to continuous flow cells. As the mura (unevenness) and muri (overburden) introduced by traditional production control recede, muda declines as well. Recently my colleague Ian Glenday and I have been thinking about ways to extend the basic heijunka concept to types of production Toyota does not conduct, specifically in the wide range of industries where technologies require the production of large batches of material. Examples are easy to find in the food industry (e.g., bottling of soft drinks), in pharmaceuticals, in paint and other coatings, and in chemicals. And as you think about it, you will see that batches are produced in many other activities as well-for example, large batches of patients waiting for a test procedure in a hospital that is designed to process all of the samples at one time in a large machine. While it would be nice to think that technologies will soon be available so that production of soda or pills or paint can be reduced to the small increments handled by traditional heijunka methods, the reality is different. The large integrated processes required for these activities, consisting of many steps that must be tightly linked and which are hard to changeover quickly, are likely to be with us for a long time to come. It would also be nice to think that dedicated product family value streams can be created to serve only a small number of products: for example, for the five part numbers that constitutes the complete product range running through the heijunka box shown in the diagram published with this article. But the reality for many batch processes is that dozens or even hundreds of part numbers must go through a common set of equipment, and this situation will be with us far into the future, no matter how clever lean thinkers are in creating “right-sized’ processes. In observing these large batch production systems in action, the first thing you will note is that things rarely go as planned. The system encounters technical problems, necessary inputs from an upstream process are missing, or the customer suddenly demands something totally different for immediate delivery. The second thing to note-as a direct result of the first-is that manufacturing managers spend much of their time rushing around to change the production schedule. These changes then cause schedule changes in all of the upstream processes. Because nothing is stable, mura, muri, and muda are everywhere. What we have discovered is that in these types of processes a different approach is required to break the mindset that believes it’s impossible to get away from constant short-term plan changes, level production, and move steadily toward stable flow. The starting point is to recognize that only a few products in any system account for most of the production volume (typically 6% of products account for 50% of the volume). It’s then not a big leap to see that you can quickly establish a stable production schedule for these products, making a given amount of each of these products (based on a standard inventory calculation) during every production cycle. For the moment, the other products will continue to be scheduled in the traditional manner. By conducting a sieve analysis to identify these products and put them on a repetitive production schedule that is unnecessary to change for extended periods, it’s possible to stabilize the great bulk of production. And by accomplishing this stabilization, it is also possible to gain a major benefit in the form of what we call “economies of repetition.” It turns out that if the same setup sequence is used every time for runs of the same length for each product, the production team is able to reduce setup times, deal with maintenance and materials issues, and adhere to standard work to an extent that is simply impossible when the production sequence is constantly changing, and run lengths for each product are also constantly varying. This situation also provides the ideal conditions to begin linking all the production steps for these products to create a true end-to-end flow through the plant. Indeed, once end-to-end flow is established, it’s also possible to pull materials from suppliers for these products in the same regular and frequent quantities. 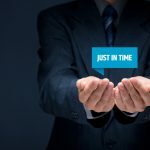 Then, as time goes on and progress is made in reducing changeover times, it is possible to incorporate more and more products into the steady sequence of “each product each cycle,” until practically the entire output is leveled. In addition, the frequency of the production cycle also increases from “every product every month” to twice a month, to weekly, and then daily. And, as the production team’s experience grows, it’s also possible to vary the volumes and the cycle to more closely match the pattern of demand. This is about as close as you can get in process industries to leveled production and one-piece flow. As we see the state of play in production activities across the industrial landscape, we’ve made great progress in eliminating muda in the form of unnecessary steps and unnecessary handoffs; for example, the elimination of intermediate inventories and extra handling, which disappear when machines are relocated in cells. At the same time, we’ve made very little progress in eliminating mura and muri, which most Toyota veterans see as the bigger problem. This situation explains why it is so important for production professionals to embrace heijunka, so that every process can be leveled by volume and mix. 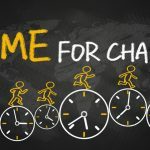 Doing so creates a different world for employees-who are no longer overburdened; for customers-who get better products on the date promised; and for manufacturers-who get to keep the money saved when muda, mura, and muri are all reduced. As a member of the Society of Manufacturing Engineers, publisher of Manufacturing Engineering, I’m glad you found an article you liked so much. (Although you cited the source, it might have been better to obtain permission, though I’m inclined to stretch a point for blogs.) The SME publications are doing a great job with lean, and it would be a good idea to join so you get them all. I just got a special issue on lean that drew on some of the best writers and practitioners out there. Go to http://www.sme.org. Yes, thanks for calling me out — I will absolutely ask for permission. I found this article very helpful and informative one in managing an industry. So true that Heijunka aka leveling is considered as the core of every business in achieving stability for a lean production. The case of Toyota is a situation that explains leveling in business. Leveling of production by volume or type or mix. This technique is also discussed in Toyota Kata. With respect to managing in process inventory, I have also learned that some companies have moved to “kitting” of parts in place of flow through racks once used for larger batch sizes. 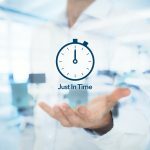 Reducing set up time can be a challenge in some industries, however, in cases like stamping, great progress has been made to reduce change over times to mere minutes and in some cases seconds. The greater difficulty is raw materials that are received in bulk quantities (coils). Material change over becomes as much of an issue. In the automotive industry, customers mandate participation in steel resale programs where a truck load of material must be procured for any given shipment. 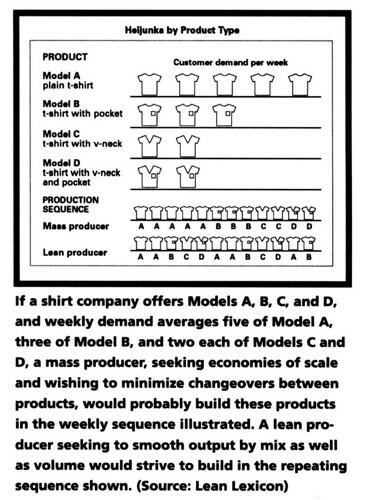 This seems to be contradictory to lean principles in the supply chain.